Q. I was stunned to discover that my new/preowned car doesn’t have a spare tire. Was I ripped off? A. Not really. About a third of new cars today do not come with a spare tire, though they may be equipped with a compressor and sealant kit to temporarily fix a flat tire. Some cars without spares come with “run-flat” tires, which are designed to operate for a limited distance after losing air from a typical puncture. Carmakers are skipping the spare because of regulatory pressure to squeeze more miles out of every gallon of fuel: Ditching the 40 or 50 pounds that a tire and jack usually add to a car’s weight helps to increase fuel economy slightly. The problem is that a sealant kit won’t help drivers if a tire’s sidewall gets sliced or if the flat is caused by more extensive damage than a tread puncture. 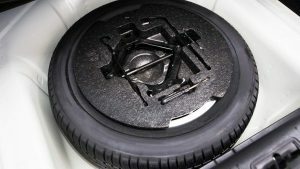 If you want to be prepared for any type of flat tire, some retailers and car dealers offer spare-tire kits, including a tire, jack, and lug wrench, starting at about $150.